His future subjects haven't always treated the Prince of Wales with the respect one might expect. They guffawed in 1986 when the heir to the British throne told a TV reporter that he talked to his plants at his country house, Highgrove, to stimulate their growth. The Prince was being droll  "My sense of humor will get me into trouble one day," he has confided to aides  but listening to Charles Windsor can indeed prove stimulating. 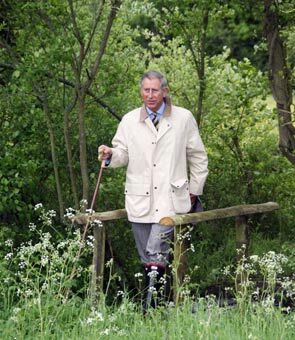 The royal radical has been promoting environmental ideas for most of his adult life. Some of his notions, which once sounded a bit daft, were simply ahead of their time. Now, finally, the world seems to be catching up with him. Take his views on farming. Prince Charles' Duchy Home Farm went organic back in 1986, when most shoppers cared only about the low price tag on suspiciously blemish-free vegetables and unnaturally large chickens piled high in supermarkets. The Prince's farm supplies barley, beets, carrots, milk, mustard, oats, parsnips and wheat to Duchy Originals, a firm he set up in 1992. In what he calls a "virtuous circle," the company markets organic products such as cookies and soups made from the produce grown by his own farm and from ingredients sourced from other suppliers using farming methods that protect the countryside. The company's profits go to charitable causes. His warnings on climate change proved prescient, too. Charles began urging action on global warming in 1990 and says he's been worried about the impact of man on the environment since he was a teenager. Although he has gradually gained international recognition as one of the world's leading conservationists, many Brits still think of him as a crank who talks to plants. This year, as it happens, South Korean scientists proved that plants really do respond to sound. So Charles was ahead of the game there, too.